One of the most common questions I get about project-based learning is “When will I have time for this?”. Teachers are concerned about adding something extra to their already busy schedules, and they just don’t know what it’s supposed to look like. The good news about PBL is that it isn’t an extra thing to add on to your schedule. Students learn and apply standards within it, so it takes the place of some of your direct instruction. Here’s the great news: Project-based learning is very similar to what you’re already doing. As a primary teacher, you are having your students learn through exploration. You are probably teaching through themed units. And you don’t have to give up the direct teaching of essential skills. In this schedule, morning work (morning bins are my favorite!) and morning meeting are done every morning. This gives a time for teachers to begin the day with skill practice and discussion. They then move into a mini-lesson (10-15 minutes), which is a great opportunity to explicitly teach and discuss what they’ll need to know for the upcoming PBL. After the mini-lesson, students get out their PBL supplies and continue working on their projects. This is heavily scaffolded. In kindergarten, the class works together at the carpet. First graders are able to explore in small groups, and second graders begin to learn independent inquiry and recording. 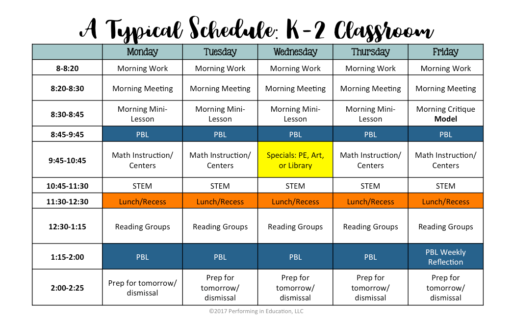 There’s a PBL block in the morning and in the afternoon, and within each block, there are several inquiry opportunities and other related activities. Students still get explicit math and reading instruction. This is often done as centers and reading groups. They even get STEM time for some more hands-on learning! I started project-based learning in my 5th grade classroom with just one subject: math. I taught all of the other subjects separately. As I moved along and learned more about PBL, I began to integrate the other subjects into my math-focused projects. I eventually branched out to some social studies/ELA-focused PBLs as a way to cover our lack of dedicated time for social studies in our school’s schedule. The schedule below is what worked best when I taught multiple subjects. We only did morning meeting once a week to review our week and prep for the next week. I also used that time to recognize students for meeting goals. The rest of the mornings were dedicated to morning work. My morning work is always a spiral of the content we’ve done so far in the year. It’s a good way to fine-tune those skills that students will eventually use again, whether on the state test or (most likely) in one of our PBLs. We start with a mini-lesson. I use this time to explicitly model or teach skills they will need to work on their project. They then get 2 hours of PBL time. This is a large block of time, but it’s broken down into independent work, group work, critique/revision, and discussion. We change modes every 20-30 minutes, depending on how the students are doing. If they’re really on task and into their inquiry, I’ll often let it go longer. If many seem stuck or out of steam, we will switch to a discussion or critique before coming back to their work. We always end with a final critique, revision, and short written response (a multi-paragraph reflection on Fridays). In the afternoon, we have some time for explicit math instruction and reading groups. This is where I teach skills that they’re being tested on or are on the calendar and we just weren’t able to fit into PBL time. In a perfect world, I would be able to integrate everything they need into our PBL, but we still have standard calendars and testing that really isn’t conducive to project-based learning. I understand the struggle, and do my best to make it work for my classroom. I know you do as well! I get a lot of e-mails from teachers that only teach one subject, that are concerned about doing project-based learning. It’s completely possible, if not a bit easier, to implement PBL in the single subject classroom. Being able to focus on one subject is a gift. When I taught only ELA in 4th-6th grade, it was such a smooth transition to PBL. Other subject areas will naturally be a part of your projects (especially ELA), and you can even work with other teachers to make connections to your project in their subject. The good news is this: if you pull students out to work on a particular subject, teach in a single subject classroom (of any grade level), or have a small amount of time with special education students, you have the unique opportunity to really focus on JUST the PBL. Project-based learning can be accomplished within as small of a block as 30 minutes. Keep materials organized and directions explicit. Teach your students the procedures of PBL and continue to scaffold the activity like you would any classroom assignment. You start your time with a 15 minute mini-lesson that teaches or models the skills they need to know to work on this piece of their PBL. This will definitely include notes if you teach middle or high school. I would also recommend note-taking for 3-5, especially those working in special education. Interactive notebooks are a great way to help the younger kids organize the notes in a visual way. Cornell notes is my structure of choice for middle/high school. The mini-lesson starts right when the students come into the classroom, so have a procedure that involves them being ready the second they enter the classroom. Time is of the essence. After the mini-lesson, students go straight into the PBL. Make sure you have explicit directions and provide organizers for the students as extra scaffolding. Break up this time into discussion, partner work, group work, and critique/revision. Use the last 5 minutes to make sure the students are prepped and ready for the next day. This includes giving them any tasks they need to work on at home. The more students are prepared when they leave, the easier the next day will be. It may seem rushed at first, but once your students are pros at the procedures, more than you thought possible will start happening during your PBL block! One of the benefits of project-based learning is that the students are engaged in the process, so you have far less time spent playing around.